Founded in 1948, PUCRS is a reference in higher education and research in the country and in the world, consisting of several units (schools, institutes, etc.) that promote professional and scientific development at the higher education level as well as theoretical and hands-on research in the main academic areas. The institution is keen to store and make the findings of its research actions and extension activities available to the public. It consists of its Main Campus, in Porto Alegre, the capital of Rio Grande do Sul and the southernmost capital of Brazil, and of another Tecnopuc unit in Viamão, in the Greater Metropolitan Area. The PUCRS campus offers a true university experience in an environment that fosters learning and growth, combining extensive and modern facilities with a highly qualified faculty. PUCRS is a microcosm of society, where thousands of people circulate daily. It is a living environment, growing harmoniously in size, complexity and quality. Its cornerstone was the Undergraduate Program in Business Administration and Finance, established in March 1931, and accredited by Decree No. 23,993, dated 1934. At that time, the institution had already been renamed to School of Political and Economic Sciences. It earned the status of a University by Decree No. 25,794, dated Nov 9, 1948. As a private nonprofit entity, PUCRS has a legal bond with its supporter, União Brasileira de Educação e Assistência – UBEA, a legal entity governed by private law. 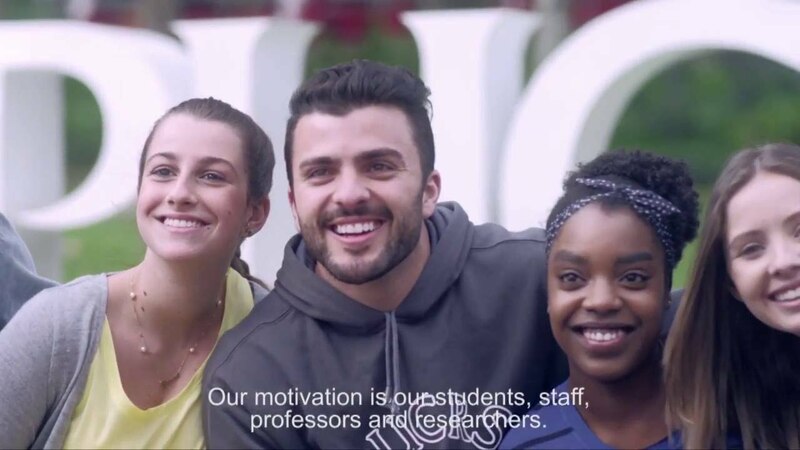 A Marist university of excellence, aimed at the comprehensive education of our students, in their religious, humanistic, scientific, professional and citizen dimensions, and which contribute to the development and progress of Rio Grande do Sul and Brazil. It is a Catholic confessional institution and has the Archbishop of Porto Alegre as its Chancellor. The title of Pontifical, granted on November 1st, 1950, by Pope Pius XII, marks its union and filial devotion to the Holy See. As a private non-profit Higher Education Institution (Ices), accredited by Act 12,881/2013, which dictates the definition, characteristics, prerogatives and purposes of Ices, it is affiliated to Consórcio das Universidades Comunitárias Gaúchas (Comung) and to the Associação Brasileira das Universidades Comunitárias (Abruc). Its coat of arms reads “Ad verum ducit”, means “Leads to the truth”, and the flag, which bears a coat of arms in the middle, are the arms that represent the Institution. The noun “University” is preceded by the adjective “Catholic”. In view of that, PUCRS is firmly committed to integrating the different academic areas and fostering the connections between faith and reason. Its commitment is also shown in the institution’s concerns with ethics and in a theological perspective, as it is closely related to the Christian community and the Catholic Church. The title of “Pontifical” is a distinction awarded by the Pope to a Catholic university. It is a recognition to the contribution of a university to Church in terms of higher education, both in Sciences and in Arts. PUCRS has been supported, since 1994, by the União Brasileira de Educação e Assistência (UBEA), a civil entity of the Marist Network. The Network operates in 18 cities of Rio Grande do Sul, in Brasília and in the Amazon. It embraces the University, the São Lucas Hospital, as well as Schools and other Social Units.